Obvod MAX471 Voltage Current Sensor môžme použiť ako ampérmeter a voltmeter pre Arduino. Napájanie je 3.3V~5V, meraný prúd max 3A DC, merané napätie 3~25V (pri 5V) alebo 3~16.5V (pri 3.3V). This module MAX471 can be used to test the current and voltage. The principle of voltage test based on principle of resistive voltage divider design, can make the red terminal connector input voltage to 5 times smaller. 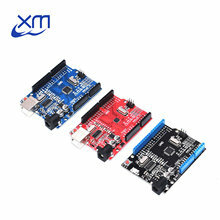 for Arduino analog input voltages up to 5 v, the voltage detection module input voltage not greater than 5Vx5=25V (if using 3.3V systems, input voltage not greater than 3.3Vx5=16.5V). For Arduino AVR chips have 10-bit AD, so this module simulates a resolution of 0.00489V (5V/1023), so the minimum voltage of input voltage detection module is 0.00489Vx5=0.02445V.